CBS Packaging are constantly looking at new innovative ways to improve our corrugated packaging options. We have recently invested in new state of the art taping machinery that allows us now to apply pre-applied, ready to seal, adhesive taped edges to our packaging. This investment in our new Vega multipoint gluer opens up new user friendly possibilities for your packaging, giving you and your customers a self-adhesive seal and easy opening solution. Peel and seal packaging that is an effective, efficient packing solution that not only is fast, easy and secure but makes your packaging look tidy and consistent giving your brand the extra professional touch. Perfect for eCommerce packaging such as postal boxes, book wraps and cardboard envelopes. A packaging option that is very easy and quick to assemble and is also designed for a simple, easy opening experience with a built in tear strip. The tear strip also doubles up as a tamper evident security solution, keeping the contents of the packaging more secure. Save money and time with super fast fulfillment times whilst drastically improving the customer opening experience with an easy, fast opening tear system. Taking seconds to seal and open your packaging. 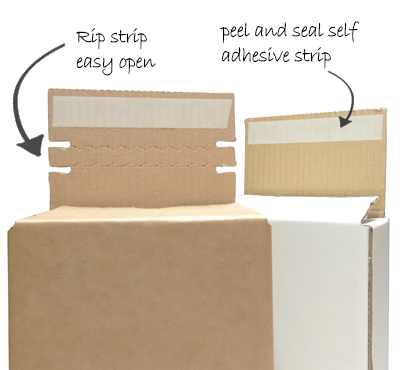 If you would like to talk to us about our new peel and seal packaging, get in touch and our expert team will be only happy to guide you on the best options for your packaging requirements. Combine our new taped edge with our printed eCommerce packaging for the ultimate opening experience. Make your brand stand out from the crowd.